My Dog Ate Wood: What Should You Do Next? You are here: Home / Health / My Dog Ate Wood: What Should You Do Next? If you’ve ever had to say this, you’ll want to know if he’s all right and what should you do next. Although seeing your dog eating bark off a tree or devouring a wooden stick can be upsetting, it’s certainly not uncommon. But is this a habit that can cause your pooch problems? In this article, we’ll take a look at what happens when your dog eats wood and the symptoms to be aware of. Is It Safe for My Dog to Eat Wood? Dogs naturally love to chew and eat. It’s not uncommon for dogs to chow down on the most unusual things. Some inedible items will be able to pass through their digestive tracts without issue. However, in the case of a dog eating wood, it can be more hazardous. What Can Happen If My Dog Eats Wood? The problem with wood is that it easily splinters. When that happens, those sharp pieces can get lodged in the dog’s mouth or esophagus. This can be very painful, and causes tearing and infections. Very small pieces of wood can be swallowed and get wedged in their throats and obstruct their breathing. If larger pieces of wood are ingested, it can create even more serious issues. Digestive tract blockages, perforated intestines and bowel obstruction are just some of the risks associated with a dog eating wood. As if that weren’t enough, some trees are toxic to dogs. This includes oak, black walnut, cherry, red maple and peach trees. My Dog Ate Wood: What Should I Do? If you’ve seen or suspect that your dog has eaten a sharp object like wood, don’t try to induce vomiting. Although this can work for some foreign objects, items that are jagged or pointed can cause more damage coming back up if the dog vomits. Even a small sliver of wood can puncture their digestive tracts. If your dog presents with any of the symptoms below, it’s best to take your dog to see the vet. They can perform a physical examination and take X-rays to see the exact location and size of the obstruction to determine if the dog requires surgery. What Symptoms Will My Dog Show If They Have Eaten Wood? You may not have actually witnessed your dog swallowing wood, but suspect that he has. His symptoms will vary depending on where the foreign object is located within his gastrointestinal system. If the wood was swallowed within two hours, chances are it’s still in the dog’s stomach. After that, it will pass into the intestines. Needless to say, the sooner the wood is removed, the less chance there is of intestinal blockage. In some cases, knowing the symptoms can mean the difference between life and death for your dog. If your dog is whining and pawing at his belly or if his stomach appears bloated, these are early signs that he’s eaten a foreign object. Getting him to the vet before it passes into his intestinal tract can reduce the chance that he’ll need surgery. A piece of wood can cause sudden, constant vomiting as the stomach attempts to eject it. If it’s a large piece of wood, it’s almost sure to cause intestinal blockage. This is an emergency situation. Other symptoms of blockage include constipation, difficulty defecating, refusal to eat and dehydration. Advanced signs are fever, seizures, collapsing and shock. Why Would My Dog Want to Eat Wood? 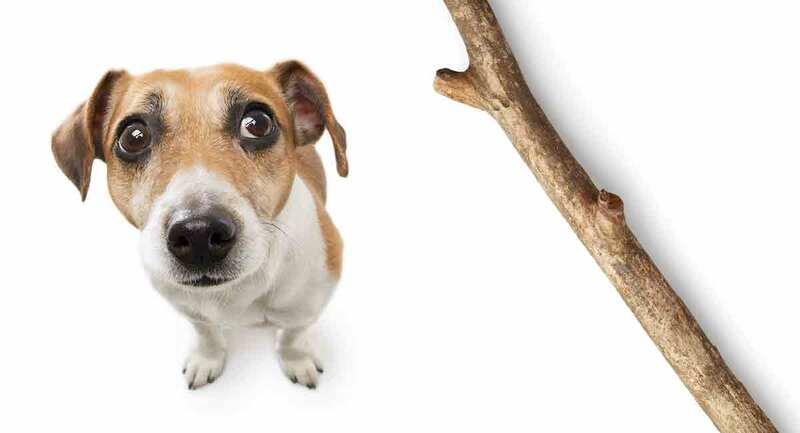 It may seem strange to you, but there are a number of reasons why your dog eats wood. It’s not unusual to see dogs chewing on sticks. They’re easy to find everywhere, and dogs are instinctively attracted to them because they make natural chew toys. Puppies especially love gnawing on just about anything. They’re curious, and use their mouths to explore the big wide world around them. Chewing can also give them pain relief when they’re teething. Most puppies grow out of this stage, but certain breeds such as Labradors, Golden Retrievers, Beagles and Pitbulls are notorious for chewing. Although occasionally ingesting a piece of bark or part of a stick may not hurt your dog, if they’re obsessively chewing on wood, it could be a sign of other underlying problems. It’s not known why dogs suffer from separation anxiety, but it’s not uncommon for them to become extremely stressed if they’re left alone. Some dogs become anxious when they’re out in the yard all day. Others can agonize if they’re in a different room when there are people in the house. Dogs don’t understand that you’re coming back, and this distress often results in destructive and disruptive behavior. Barking, whining, drooling, digging and howling are all symptoms of separation anxiety. Chewing, which can lead to ingestion, is another sign. Their anxiety can cause them to chew on wood furniture in the home or bark on trees if they’re left outside. If your dog is sitting alone waiting for you to come home, he can easily get bored. Many dogs were bred with an instinctive work ethic. If they have nothing to do all day, it can lead to negative behavior like chewing. A dog needs to be both physically and mentally active. Chewing is just a way for him to entertain himself. Puzzle toys are one way to keep your dog intrigued and engaged. This article will give you information on the importance of mental stimulation for your dog. Pica, a condition of eating non-food materials, is considered an obsessive compulsive disorder. In addition to separation anxiety and boredom, other causes of pica are hunger and loneliness. There could also be underlying medical reasons for this disorder, including anemia, parasites, diabetes, digestive problems, iron deficiency, hyperthyroidism and tumors. Vomiting, diarrhea and chronic bad breath are symptoms of pica. Labrador Retrievers in particular are prone to suffer from this disorder. Having something to chew when their teeth are coming in can relieve a puppy’s sore, sensitive gums. Instead of chewing on sticks, this is a good time to introduce appropriate chew toys to your puppy. Older dogs who have dental problems or gum disease may also chew sticks to alleviate discomfort in their mouths. The best way to stop your dog from eating wood is to keep it away from him. Obviously, this can be easier said than done, especially if you have a lot of trees in your yard. However, the more sticks and pieces of wood you can clean up and keep out of his way, the better. If you have a wood pile or stacked logs for firewood, cover them up so he can’t get at them. If you’re using wooden sticks to play fetch, your dog won’t be able to differentiate between wood and toys. It’s better to always use a toy to discourage any association between wood and playthings. You may have to try different chew toys to find something he likes to replace the wood-eating habit. Make sure you’re getting dog-safe toys that can’t be chewed into little pieces and become a choking hazard. They should also be larger than your dog’s throat so he doesn’t accidentally swallow them. A Kong toy filled with a favorite tasty treat also makes a good distraction. If you think your dog is eating wood because he’s bored, lonely or not getting enough exercise, try spending more time together. Almost every dog needs a minimum of 30 minutes of physical activity a day to keep him healthy and happy. Larger breeds require even more regular exercise. This could be going for walks in the park, jogging or playing games. Like people, dogs need socialization. If they’re stuck in the house or the backyard all day, it can cause them stress and could be the underlying reason why they’re eating wood. If your dogs eat wood, they’re at risk of becoming seriously ill. The dog may pass it without incident. But whenever your pet consumes a sharp object, there’s a potential risk of doing damage to his gastrointestinal system. Dogs who’ve digested wood often vomit and have abdominal pain. Getting rid of it before it passes into his small intestines is crucial. The best thing you can do for your dog if he’s eaten wood is to take him to the vet where he can be checked out. If your dog consumes wood consistently, you need to determine the reason behind this behavior.